The Suncast Deck Boxes are made of weather resistant, Durable High Impact Polypropylene Resin which includes a special UV Sun Protectionand are easy to assemble. The Suncast Deck Boxes are made of weather resistant, Durable High Impact Polypropylene Resin which includes a special UV Sun Protection and are easy to assemble. Not only do they offer a place to store yard and garden accessories, they provide a great addition to your outdoor decor. 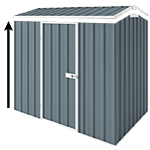 This model has a 374L capacity which provides storage and seating. It is ideal for storing garden and pool accessories; and it can hold 4 large chair cushions and 1 chaise cushion. Ideal for storing garden and pool accessories. Light weight and durable deck box includes floor and comes in light taupe colour. Easy DIY assembly, no tools required. FREE Home Delivery Australia Wide.